The drug which made six men seriously ill during a trial caused the glands of two monkeys to swell in earlier tests, the company which developed it said. 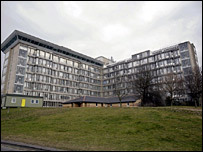 But TeGenero said the symptoms differed from those the men being treated at Northwick Park Hospital suffered. Doctors said four of the patients were taken off organ support. Two others remain in a critical condition. The men fell ill last week at a ward next to the north-west London hospital during tests on the drug TGN 1412. A man who took a placebo as part of the trial has described how the men suffered agonising spasms after being injected. Doctors said the men who are critical have made some improvements but it was too early to comment on their prognosis. The men were injected with the drug which is being developed to treat rheumatoid arthritis, leukaemia and multiple sclerosis. TeGenero said two of 20 monkeys used in earlier tests suffered an increase in the size of lymph nodes but this information was given to the men and submitted to the test regulators. Scotland Yard said its officers are talking to the MHRA and doctors. Chief Scientific Officer at TeGenero Thomas Hanke said: "We are encouraged by the progress being made by the volunteers, but remain deeply concerned for all of them as they continue their treatment." A statement from Northwick Park Hospital said: "We are pleased that the four seriously ill patients are continuing to respond well to their treatment and are making a steady recovery. "However, the medical team remain cautious and, in the light of the complexity of the men's condition, feel it is still too early to comment on prognosis." The statement said the pair in a critical condition were "under sedation for their own comfort while they receive organ support".